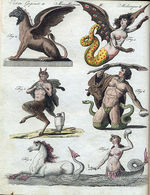 Mythical creatures have always retained the fascination of the people during all phases of history. Even in today’s modern world, many people still find legendary creatures and imaginative animals highly intriguing. There are many different types of creatures that can be distinguished as mythical. These creatures include those that are described in the Holy Bible, various types of serpents, fire breathing dragons, creatures that are half human, beasts of the land, beasts of the sea, and beasts of the sky. Many individuals go their whole lives attempting to learn as much as they are able to when it comes to the mythical creatures of the world. Several spend countless years pouring over books, digests, and other resources attempting to uncover the truth behind these strange and unusual beings. There are some that have a personal lifelong goal to experience many of these mythical based creatures firsthand. Many get the pleasure of expressing their personal accounts of interaction with such creatures, while others are unable to. Countless movies, documentaries, television shows, books, and other forms of media cover these strange and unusual creatures in both a fictional and nonfictional manner. Occasionally, we hear stories on local and national news channels that highlight eye witness accounts and personal experiences with these unusual animals and other types of creatures. Here, we will attempt to create a one stop resource on a large number of creatures. It is important to check back regularly in order to learn about the new additions that are placed here. Throughout this page on Greatest Unsolved Mysteries, we will cover a wide range of creatures that mystify the mind, defy the "norm" when it comes to life on the planet, and perplex the mind. If you are interested in creatures that fly, creatures that thrive on the blood of humans, animals that seem to hide in the depths of the sea, or any other unusual life form, you are likely to thoroughly enjoy this section. You can finally experience these fascinating creatures firsthand while learning about the wonderful and unsolved mysteries that surround them. The Banshee of Ireland is very popular among the Irish. Could there be true to life mermaids? The Greek mythology Minotaur is one of the most popular stories of mythology. When evaluating the history of the werewolf, you will discover that the creature is not a wild animal, but rather a man that transforms into a wild animal that seems to have absolutely no inhibitions. There are many superstitions associated with the Tikbalang.